As our soil quality begins to deteriorate, many people are looking for alternative methods to grow fresh vegetables for their future homes. Because of this reason, hydroponics agriculture will become more popular in the future. Aeroponics is a simple concept yet it is the most technical among all 6 types of hydroponic systems. Aeroponic system is used by a lot of home growers because it has brought really good results for them. Let’s get into details about this technique. Aeroponics is actually a subset of the hydroponic system. However, with the hydroponics method, plants use water as the growing medium while aeroponics uses no growing medium at all. This technique was invented during the 1940s and since then, many researchers have added to the theory and application of this method. Aeroponics is considered one of the best methods to grow plants in a soil-free environment and the need for this method has been growing due to a clear need for a more convenient way to grow plants. In the aeroponic system, plants are not contained in any solid material such as Rockwool or soil. Instead, plant roots are hung in the air in a grow chamber in a closed-loop system. The roots are sprayed with nutrient-rich water or fine, high-pressure mist containing nutrient-rich solutions at certain intervals. As all plants need nutrients, the organism will spend a valuable amount of energy growing roots to find these pockets of nutrients in the soil for flower formulation and growth. With hydroponics and aeroponics, nutrients are instead delivered straight to the roots. Compared to regular hydroponic plants, the plants tend to grow faster and absorb more nutrients because the roots are exposed to more oxygen. Also, there are fewer threats of diseases around root zone disease because there’s no place for debris or pathogen to reside. However, you need to be aware of the fact that aeroponic system chambers are constantly wet with nutrients spray which is convenient for harmful bacteria and fungi to develop. Therefore, it is important to clean and sterilize these misters before using, and occasionally take out and keep these chambers treated with the hydrogen peroxide solution, which can be purchased at any quality hydroponic store. HOW DOES THE AEROPONIC SYSTEM WORK? In the aeroponic system, plants are usually inserted into the platform top holes on top of a reservoir and placed within a sealed container. Due to no root zone media for plants to anchor in, you need to prepare a support collar that will hold stems in place. These collars must be rigid enough to hold plants upright and keep the roots in place but flexible enough to allow room for roots to grow. 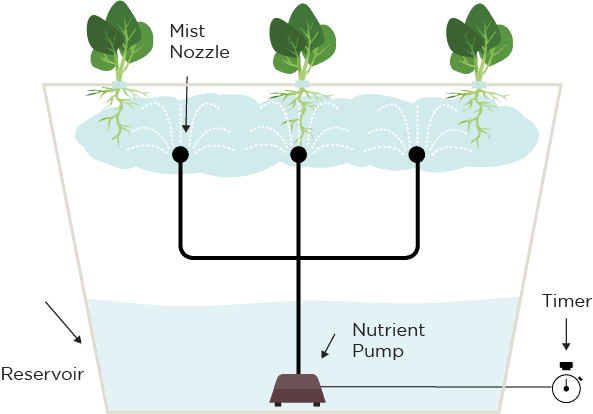 The pump and sprinkler system creates vapor (which is a hydro-atomized spray mixture of water, nutrients and growth hormones) out of the nutrient-rich solution and sprays the mist in the reservoir, engulfing the dangling plant roots and absorbed by them. This spray provides the exact amount of moisture which stimulates the plant's growth and allows it to develop turgidly. The timer supplies the timed spray intervals and duration for the plants. Some people think that growing plants in aeroponic system would be frailer compared to hydroponics. But that’s not true. The secret of aeroponic system all lies in the amount of oxygen exposed to the roots without a root zone media limiting it. Thanks to this, the plant roots will develop rapidly and grow in a moist air-rich environment. If you want to see their development rate, just lift up the growing chamber to see how they are growing. This is the most commonly used aeroponic type used by most hydroponic hobbyists due to its ease to set up, availability at any hydroponic shop, and low cost. Low-pressure creates droplet size much different from the high-pressure aeroponic system. 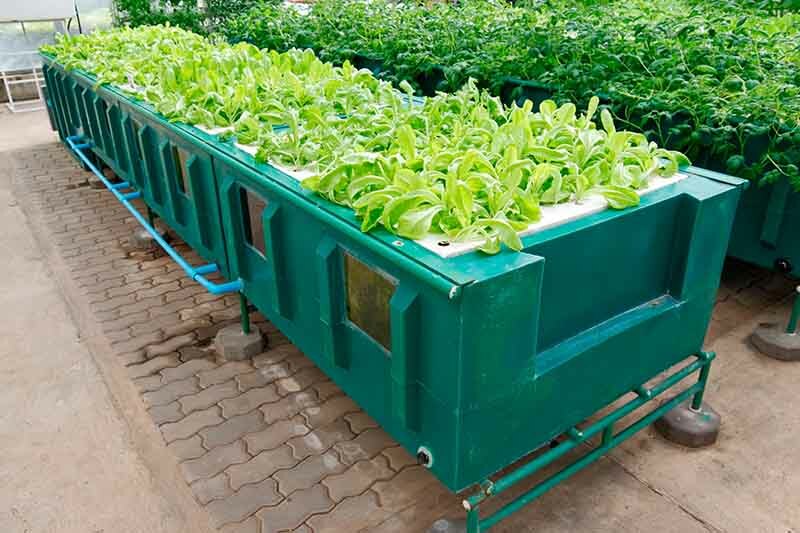 What you need for this system is just like any hydroponic system – a pump strong enough to move the water onto the sprinkler heads to spray water around the plant root zone. This type of Aeroponics is more advanced and quite costly to set up as it would require specialized equipment. So they are often used in the commercial production rather than home growers. The HPA must run at very high pressure to atomize water into tiny water droplets of 50 microns or less. This system creates such a fine droplet size that create more oxygen for the root zone than the LPA, making it the most efficient system among all aeroponic types. Ultrasonic fogger Aeroponics, or commonly called fogponics, is another interesting type of Aeroponic system. As the name means, growers would use an ultrasonic fogger to atomize water into super small droplets of water. These are very tiny and you will see it in the form of fog. Though plants roots find it easier to absorb water in tiny size, there’s little moisture in the fog created, and when running over time, it can easier create the salt that can clog these foggers than other Aeroponic types. For more details about this system, please refer to our post about fogponics. You can use this system to grow nearly any type of plants and cultivars such as vegetables, nursery stock, houseplants, and bedding. Hundreds of species of plants have been tested and grown successfully by commercial greenhouse owners, researchers and nursery operate using this technique. You can purchase these tools at the local gardening/hydroponic supply store or online. 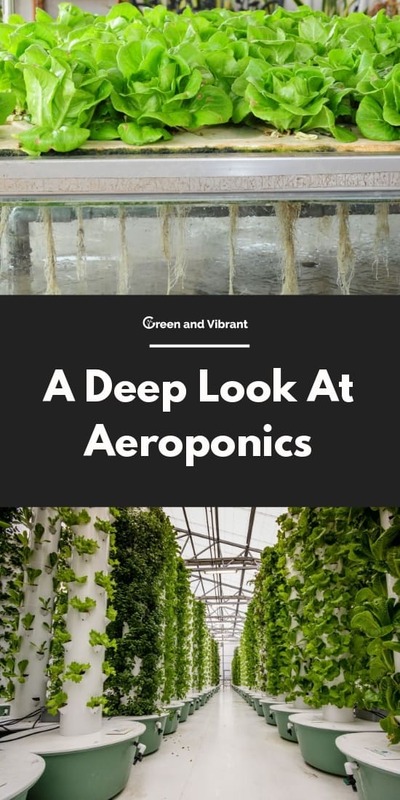 It’s quite easy to understand how an aeroponic system works. The purpose of the plant roots hanging in mid-air is to get them exposed to oxygen as much as possible. The high volume of oxygen exposure will stimulate their growth and help them grow faster than they would in the soil, which is a very important benefit of this type of system. This can be seen in the massive root growth of the plants. It has also been proven that this technique increase crop yield X10 compared to using soil. Not only will you be able to collect healthier plants but also grow more crops per year. No growing media is needed with aeroponics. You can use baskets or closed cell foam plugs (compress around the plant's stem) to suspend the plants. These tools fit in the small holes on top of the growing chamber. In the growing chamber, the mist nozzles will spray the nutrient solution to the plant roots at short intervals. This regular spray has benefits of keeping the roots moist and provide the nutrients they need. The growing chambers should be airtight and light proof (to prevent the root zone being penetrated by lights and make algae cannot thrive). It must allow air to get in for the growth of plant roots but you also don’t want pests to get in or water to spill out. The chamber needs to be able to hold in the humidity as well. The ultimate factor which creates a successful aeroponic system is a balance of plenty of moisture, nutrients and fresh oxygen that you can provide to the roots. Finally, a major factor which contributes to the success of this system is the water droplet size. A fine mist would create much faster-growing and bushier roots. These roots also have more surface area to absorb the oxygen and nutrients compared to those sprayed with small streams of water from small mist nozzles. This will also mean faster-growing plant canopy. Massive plant growth because plant roots are exposed to oxygen 24/7. This promotes healthy and fast-growing plants. The mist used on the roots can also be sterilized to prevent plant diseases. Little space required. You don’t need a lot of space to be able to set up this system. Plants can be added up one on top of each other. With this type of modular system, you can maximize the use of limited space. Great educational value. Adults and kids can use this system to grow pet plants and learn a great deal about plants without needing to get their hands dirty. Require constant attention with pH and nutrient density ratio because this system is sensitive. Understanding what is the right ratio and applying this concept may be difficult for beginners and can only be attempted by those who are more familiar with such systems. Susceptible to power outages. You will have to water your plants manually if this happens. Dependence on the system. An aeroponic system is made of mist nozzles, high-pressure pumps, and timer. If one of these breaks down, your plants will die easily. Require regular disinfection of the root chamber (a common disinfectant is hydrogen peroxide) to prevent root diseases. Microorganism can be introduced to plant roots through water. In conclusion, the best benefits of aeroponics are the massive plant's growth and higher yields compared to other systems. However, these advantages also come with a cost. The price to set up the system is quite expensive and it also requires technical expertise as well as advanced knowledge (about pH and nutrient density ratio) for this special kind of plant cultivation. If you are a beginner in the domain of growing hydroponically, I would say really weigh the pros and cons and choose the best system that you think will work for you at this stage.